We recommend the solution that's right for you—rather than push you in one direction. Mat thickness 1" or 1.25" 1.625" 1.5-2.0"
Not sure which mat is right for you? We can help you decide. New and used, remnant and reconditioned. Check out our current inventory of in-stock, ready-to-ship Classic wrestling mats. Our current selection of in-stock LiteWeight mats. Various sizes and colors, new and used—and ready to ship. 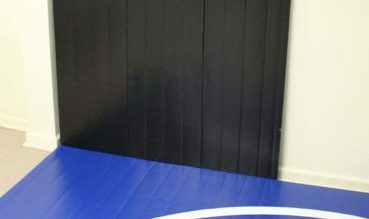 Our in-stock home-use wrestling & grappling mats are made of the same high-quality materials used on our full-sized competition mats. The home use wall padding kit makes it easy to create an area for training and practice in your house, basement or garage. Shop our selection of accessories for Classic and LiteWeight Mats, including cleaning & maintenance supplies and transport & storage options.